Motivated by some clever people on the internet, I decided to feed some squirrels some peanuts, but make them work for it. A little harder each day. 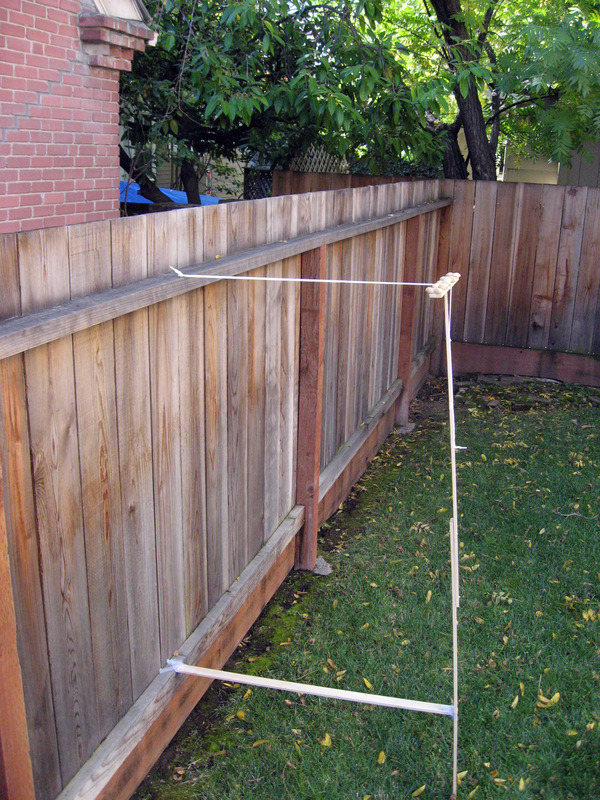 This is the log showing the progress of the "2007 Squirrel Obstacle Course". Click on any picture for a much larger original version. 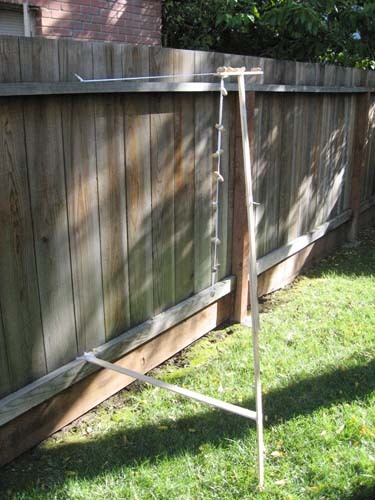 A very simple "T-Bar" with peanuts. 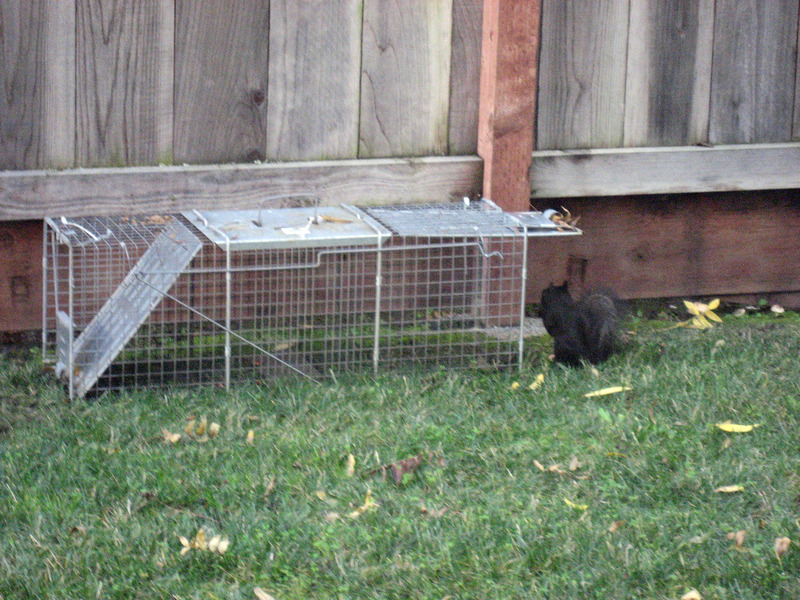 The squirrels walked out into the yard and grabbed them and took them back to their favorite trees to eat (or store). A little further along in the day, the peanuts are on a flat stick about the width of a ruler leading out across from the side of the fence. The squirrels like hanging out on that railing, so they are comfortable there as a starting point to go looking for peanuts. 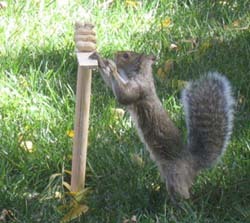 It will become important that the Squirrels understand that peanuts are sometimes found along ropes. In this case a white shoelace. So I replaced the stiff horizontal "ruler width" stick with a white shoelace to get to the peanuts today. In the picture below, the shoelace is "tight" so you can't really see it unless you click on the picture below to get a big version. 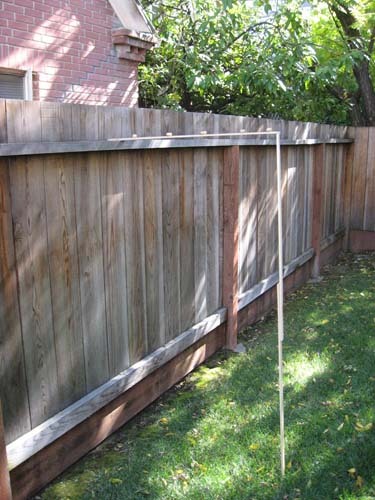 The stick below is just to stabilize the vertical stick -> when the squirrels hang on the shoelace it will bend the vertical stick towards the fence. 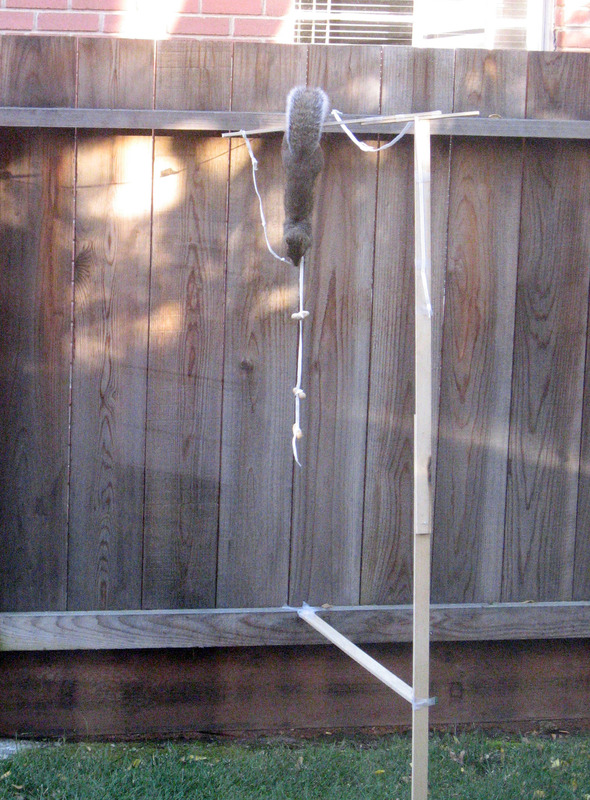 ADDITIONAL NOTE: the squirrels learned to "shake" the platforms and the peanuts would fall off. 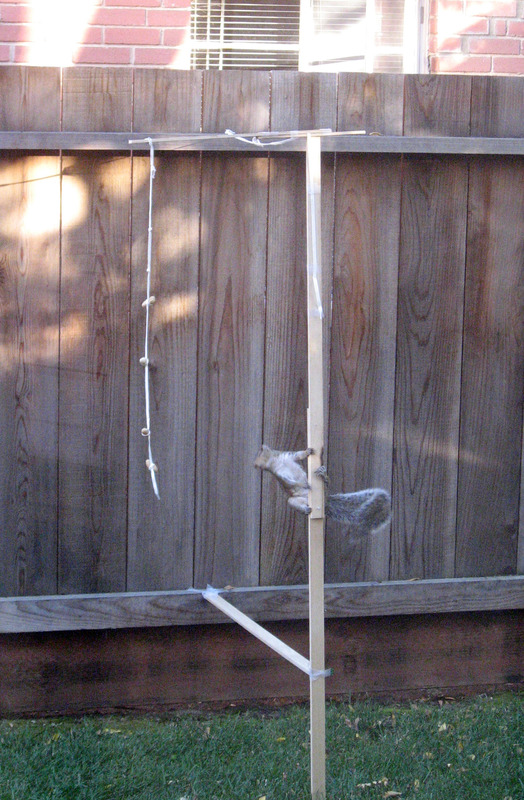 So we now use just a bit of scotch tape to affix each peanut in place so the squirrels must climb to harvest their peanuts. 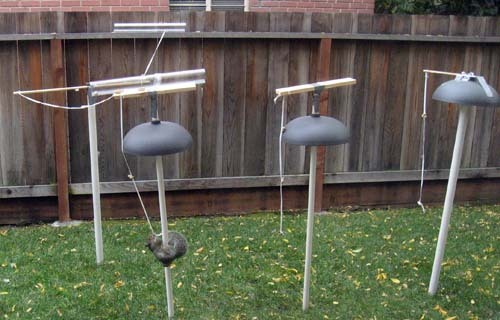 For this day, we want to get across the the squirrels that peanuts grow on vertical ropes (also known as white shoe laces) that hang from various places. Below is the first lesson -> the shoe lace can be reached from the vertical pole. Below is a squirrel caught in the act of eating a peanut (look closely at his mouth). 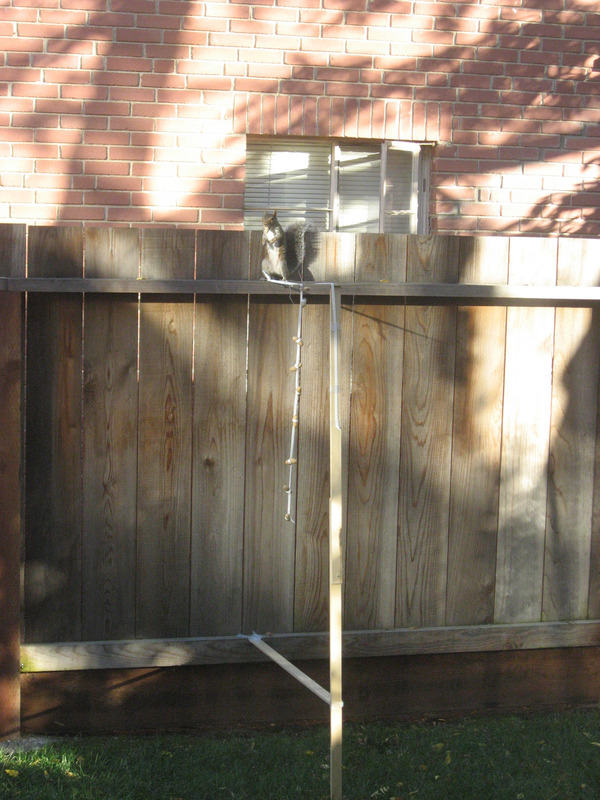 And here the squirrel figures out the peanuts are "growing" on the vertical string. 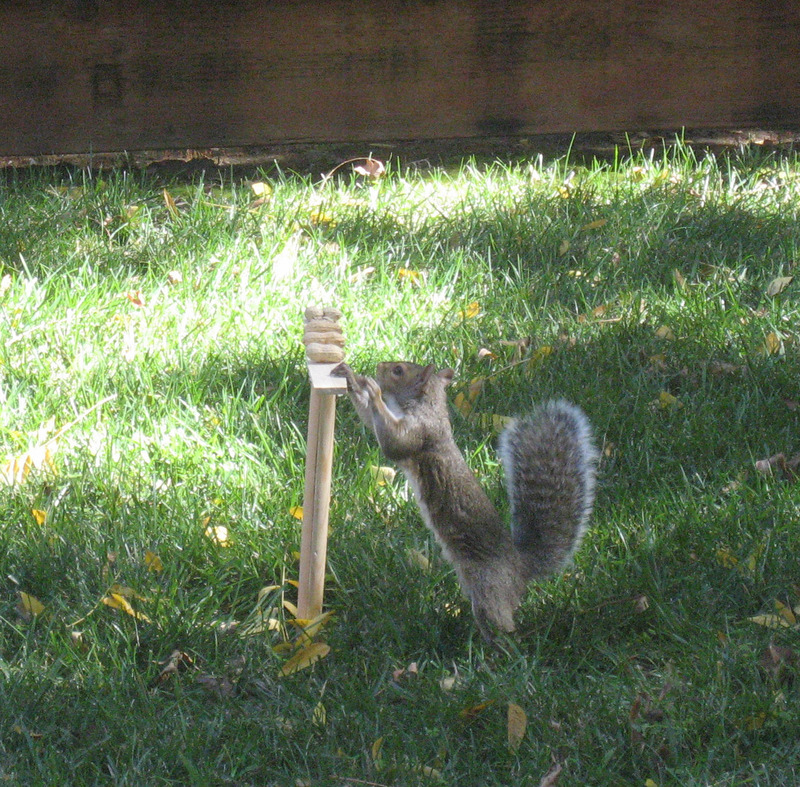 By the end of the day, we watched this squirrel scamper up this pole and immediately go for the peanut string every time. For today, we moved the string further away from the pole. 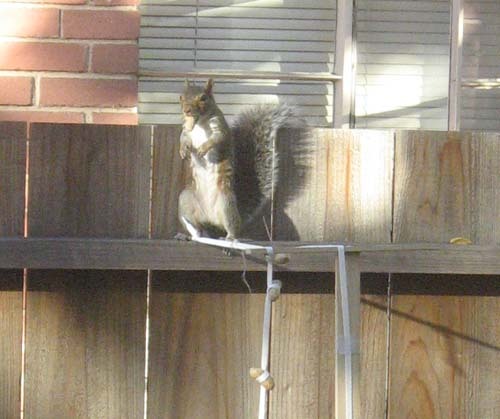 Here is a slightly confused squirrel looking at the peanuts which somehow moved further away last night. No problem! 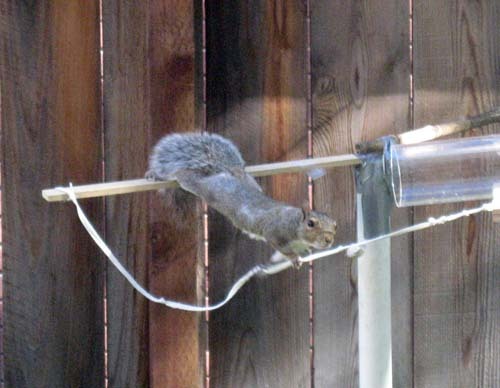 The squirrel adapts and overcomes, and learns to hang over the edge and pull up the rope and collect the peanuts. 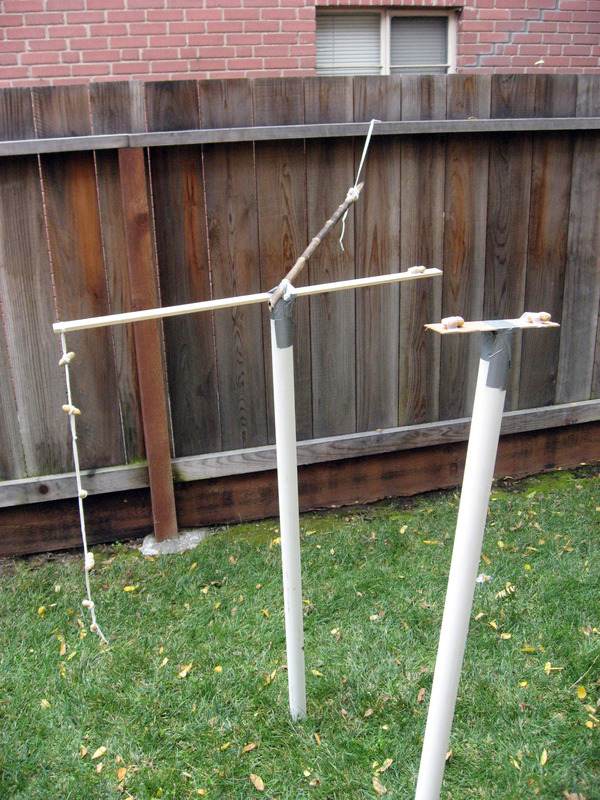 We decided the wood frame wasn't solid enough, so we have moved up to PVC pipes and duct tape now. 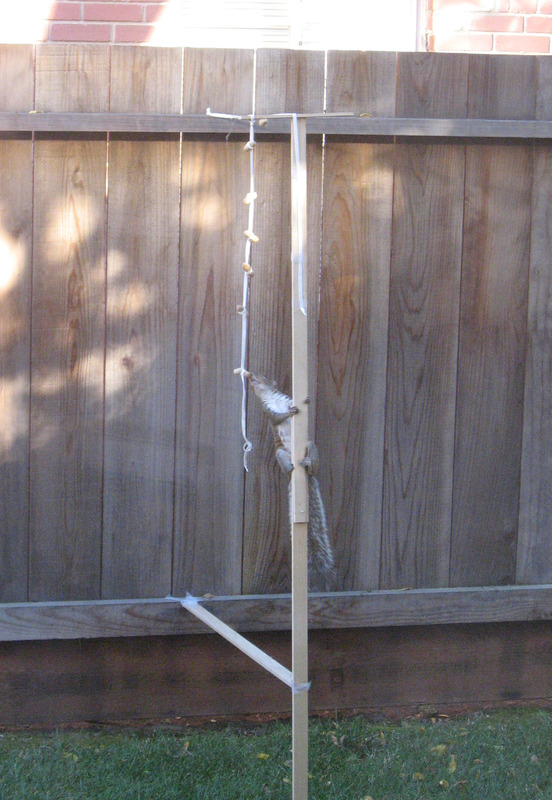 We also added a longer distance from the fence to the first pole, and a SECOND PVC pole to see if the squirrels will do a multi-stage "hop" to get peanuts. Click on the movie below to watch a YouTube version. For Windows computers ONLY CLICK HERE to see a very high quality version. 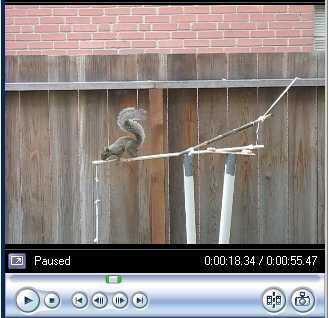 Click the above to watch a YouTube video of the squirrel navigating the obstacle course. 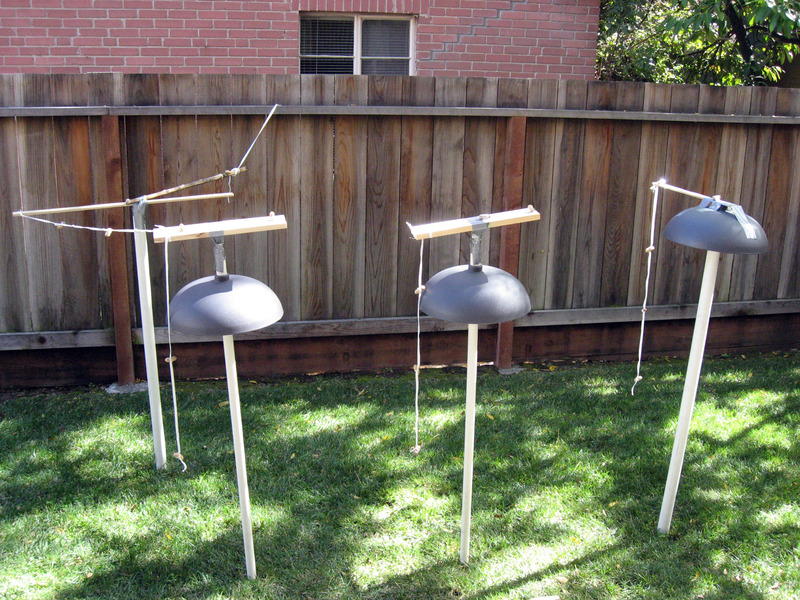 We bought some "Squirrel Baffle" upside down bowls from the internet, they seem to work very well. 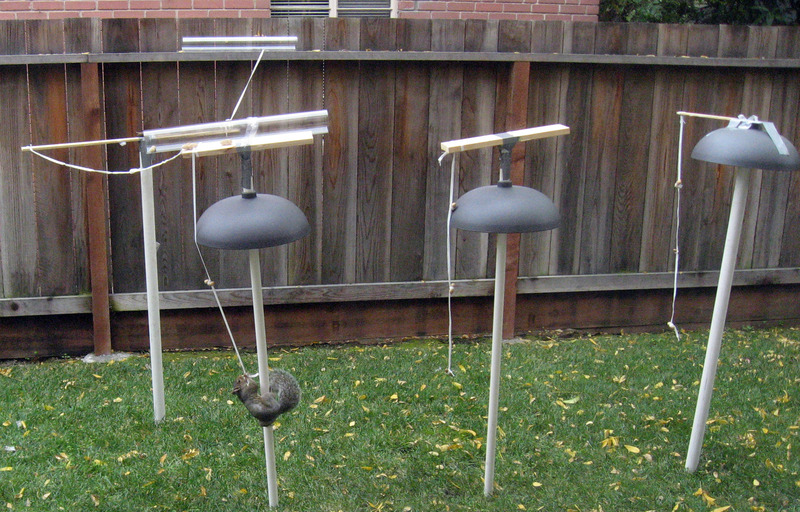 Below you can see the bowls mounted on PVC pipes, and the squirrels can no longer get on top of the bowls. These were called "Two-Way Squirrel Baffle" (you can put them over a bird feeder, or under a bird feeder). Below is a picture of the obstacle course. We got a couple clear plastic mailing tubes. 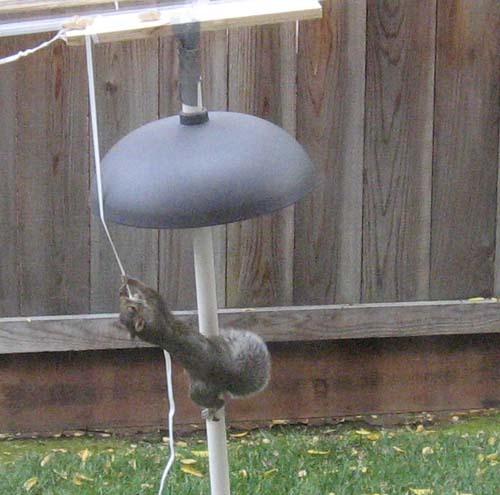 Below is a squirrel grabbing a peanut -> we aren't hanging the ropes far enough away yet. On top of the pole with a squirrel is one of the clear plastic tubes with peanuts inside. Below is a close up. 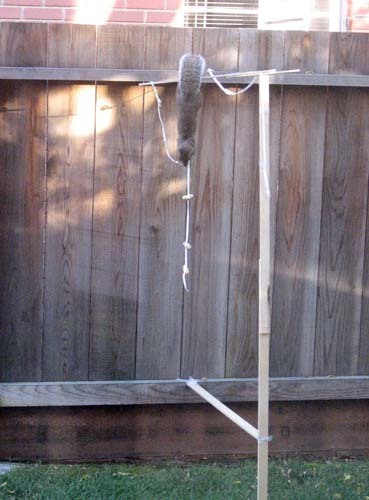 The squirrel can't get to the top of the pole, but he can still reach horizontally out and get the shoelace, which is not what we intended. Here is a random shot showing the squirrel crawling along the horizontal shoelace to get to a peanut. Click on the movie below to watch a YouTube video of a squirrel trying to figure out how to get the peanuts. For Windows computers ONLY CLICK HERE to see a very high quality version. If you are on a Macintosh and want to watch the Windows Media Format high quality version, install this product first: "http://www.flip4mac.com/wmv.htm". 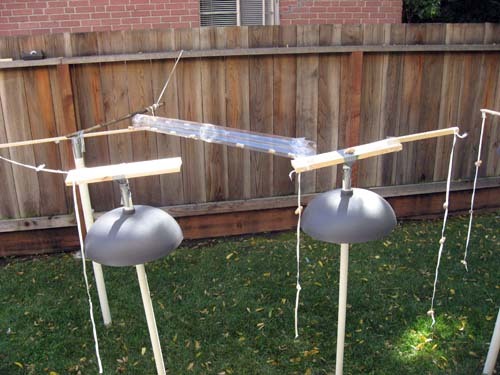 The squirrels didn't seem to learn the tubes when they were in hard places, we modified them to make a long bridge containing peanuts inside of it. See the setup below (click on the picture to see a big blowup of the tube). 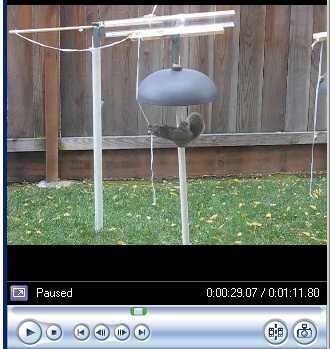 Click on the movie below to watch a YouTube video of a squirrel climbing inside of the tube for the peanuts. For Windows computers ONLY CLICK HERE to see a very high quality version. 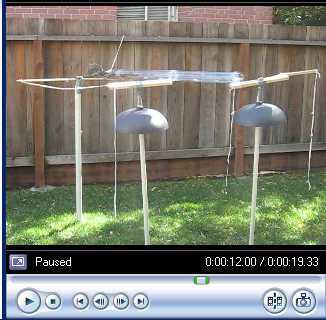 If you are on a Macintosh and want to watch the Windows Media Format high quality version, install this product first: "http://www.flip4mac.com/wmv.htm". 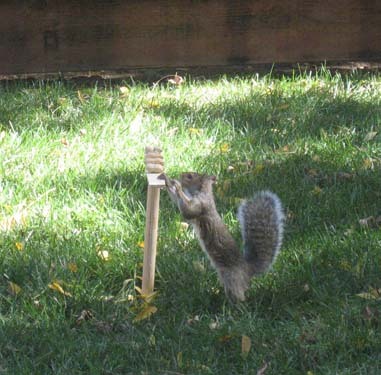 Click the above to watch a YouTube video of the squirrel climbing inside of the tube to get a peanut. 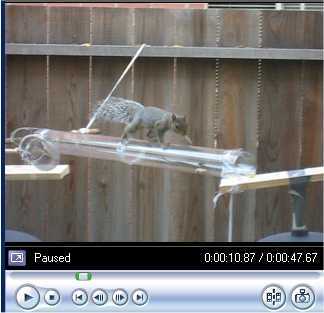 Here is a video from the morning of this day (before the big white barriers), which shows how the squirrel runs across the top of the tubes with no barrier. The squirrel then goes INSIDE the tube, but only to get the peanut out. 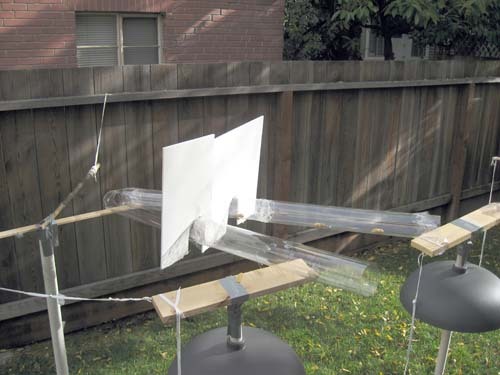 We want the squirrels to run through the tubes for longer distances, thus the above barriers. 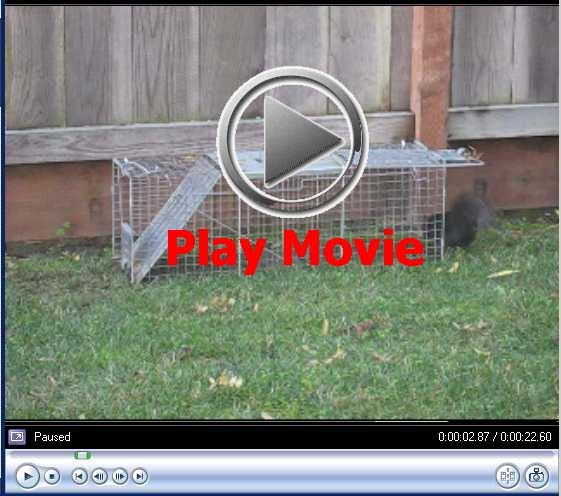 Click on the movie below to watch a YouTube video of a squirrel climbing inside of the tube for the peanuts. For Windows computers ONLY CLICK HERE to see a very high quality version. If you are on a Macintosh and want to watch the Windows Media Format high quality version, install this product first: "http://www.flip4mac.com/wmv.htm".